KNOXVILLE, Tenn. — No. 24/24 Tennessee will close its 2016 regular-season schedule against Vanderbilt on Saturday with a 7:30 p.m. kickoff at Vanderbilt Stadium. Saturday’s game will have a SEC Network broadcast with Tom Hart (play-by-play) and Andre Ware (analyst) in the booth and Cole Cubelic reporting from the sidelines. Tennessee (8-3, 4-3 SEC) is 4-0 when on the SEC Network or SEC Network alternate this season. Hart, Ware and Cubelic were on the broadcast for UT’s wins over Ohio (Sept. 17) and Kentucky (Nov. 12). Fans can also listen live on their local Vol Network affiliate with Bob Kesling, Tim Priest and Brent Hubbs in the booth and John Brice on the sidelines. Tickets can be purchased online at VUCommodores.com. Tennessee and Vanderbilt (5-6, 1-6 SEC) will square off for the 110th time on Saturday. The Vols hold a 75-29-5 edge in the all-time series and have won the last two meetings. In 2015, Tennessee took a 53-28 win over the Commodores at Neyland Stadium. The Vols are coming off of a 63-37 win over Missouri in which quarterback Joshua Dobbs accounted for five touchdowns (three passing, two rushing) and ran for a career-high 190 yards. Vanderbilt is fresh off of a 38-17 victory over Ole Miss. · Saturday’s contest is the 110th meeting between the programs in a series that dates to 1892. Tennessee is seeking its third straight win in the series and its 15th win over the Commodores in its last 16 trips to the capital city. · The Vols have won 30 of the last 33 games in the series. · UT is 37-18-4 against Vanderbilt when the game is played in Nashville. · During its current three-game winning streak, the Tennessee offense has come to life. The Vols are averaging 55.7 points, 559.7 yards of total offense and 313.0 rushing yards per contest during that span. · Tennessee’s 167 points are the most it has scored in consecutive games since 1915 when it scored 181 points over two ballgames. · Over its last three games, Tennessee has averaged 9.4 yards per offensive play (1,679 yards of total offense on 178 offensive plays). · Most recently against Missouri (Nov. 19), the Vols racked up 609 yards of total offense on just 67 offensive plays, including 386 rushing yards on 45 attempts (8.6 yards per carry). · Against Kentucky (Nov. 12), the Vols finished with 599 yards of total offense on 59 plays. UT’s 10.2 yards per play in that game were its most since 2009 when it set the school record with 10.9 yards per play (also against Kentucky). · After scoring just 23.0 points per game in its three October losses, Tennessee’s offense has averaged 55.7 points per game through three wins in November. · Tennessee has scored 40 or more points in three straight games for the first time since 1995. · The Vols have scored 49 or more points in at least three games in back-to-back seasons for the first time since 1995-96. · The 63 points scored vs. Missouri were most against an SEC opponent since 2000 (vs. Arkansas, 63-20). · UT is averaging 559.7 yards of total offense over its last three games with 21 offensive touchdowns (12 rushing, 9 passing). 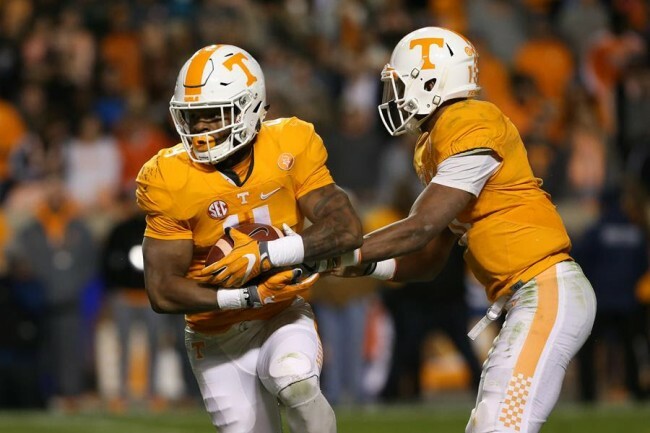 · The Vols are also averaging 381 rushing yards over their last two games with 9 rushing touchdowns. Tennessee posted a season-high 386 yards on the ground vs. Missouri last week. · Of Tennessee’s 21 offensive touchdowns scored over the last three games, 12 have come in drives consisting five plays or fewer, 10 have been scored in drives lasting two minutes or fewer and seven were scored in less than a minute. · Tennessee ranks 10th in the country and 2nd in SEC in red zone offense, scoring at a 92.5 percent clip (37-of-40) when moving the ball inside the opponent’s 20 yard line. · Of the Vols’ 37 red-zone scores, 31 have been touchdowns (13 pass, 18 rush). · Tennessee’s Sept. 24 victory over Florida is the only game this season in which the Vols failed to score in the red zone. UT went 3-of-6 in the red zone against UF, but have scored at a 100 percent rate in the red zone across its other 10 games. · Over its last three games, Tennessee is 10-for-10 in the red zone. UT has had to settle for a field goal only one time during those 10 trips, scoring nine touchdowns during that span. · Senior quarterback Joshua Dobbs has thrown for three touchdowns in each of his last three games, giving him a career-best and SEC-leading 24 touchdown passes on the year. · Last week’s trio of touchdown strikes against Missouri marked the 17th game of his career with multiple touchdown passes. Seven of those games have come this season. · Dobbs’ 2,315 passing yards this season are also a career-high. · This season, Joshua Dobbs has a single-season career-high 2,975 yards of total offense. He is looking to become only the fourth player in school history with a 3,000-yard season, joining Peyton Manning, Tyler Bray and Erik Ainge. · Dobbs and Manning are the only two players in school history with at least 2,950 yards of total offense in two different seasons. · Dobbs now has 50 career touchdown passes and 29 career rushing touchdowns. He became the fourth SEC quarterback to achieve 50 passing touchdowns and 25 rushing touchdowns in his career, joining Florida’s Tim Tebow, Texas A&M’s Johnny Manziel and Mississippi State’s Dak Prescott. · Junior wideout Josh Malone has caught four touchdown passes over the last three games, including a 57-yard score last week vs. Missouri. · Malone has a career-high nine receiving touchdowns this season, tied for the seventh-most in a season in school history and is the most by a Vol since Justin Hunter in 2012. · The Gallatin, Tennessee, native has made the most of his catches this season as well, averaging 19.24 yards per reception. That figure ranks second in the SEC and 17th in the nation. · Defensive lineman Jonathan Kongbo put the finishing touches on Tennessee’s 63-37 win over Missouri last week, intercepting a Drew Lock pass and racing 59 yards the other way for the score. · It was Tennessee’s first defensive touchdown since Corey Vereen recovered a Derek-Barnett-forced fumble in the end zone against Georgia (Oct. 1) and was UT’s first pick-six since Evan Berry returned an interception 100 yards for a touchdown in last season’s Outback Bowl. · Having missed the previous two games with an injury, redshirt junior tailback looked sharp in his return to the field last week against Kentucky. · Kamara rushed 10 times for 128 yards and two scores. It was the fourth 100-yard game and the fifth multi-touchdown game of his career. · According to the NCAA, Tennessee has faced the nation’s toughest schedule through 11 games. · The Vols’ first 10 FBS opponents have a combined winning percentage of .670 (61-30). · Tennessee has faced four ranked opponents, including two ranked inside the top 10. The Vols are 2-2 in those games. · Nine of Tennessee’s 10 FBS opponents this season are bowl eligible. · With last week’s 63-37 win over Missouri, the Vols have now won eight consecutive games in the month of November dating to 2014. · UT is 11-4 (.733) in November under Butch Jones. · Since 1990, the Vols are 90-20 (.818) in November, including 21 consecutive wins in the month from 1990-96. Tennessee is 321-125-21 (.710) all-time in November. · In two seasons on Rocky Top, Alvin Kamara is averaging nearly 100 yards and more than a touchdown per game in contests in which he receives 10 or more carries. · Kamara has received 10 or more carries in nine games in his career, putting up 862 total yards and 11 touchdowns in those games. · In that same span and when logging 15 or more carries, Kamara is averaging 111.8 yards and 1.2 touchdowns per game.